Polymer suspension insulatoe is used on overhead suspension or tension power transmission lines, and suitable for the middle and above contamination areas, particularly in the heavy contamination areas. Generally, the voltage level for polymer suspension insulator is from 10 KV to 1000KV. 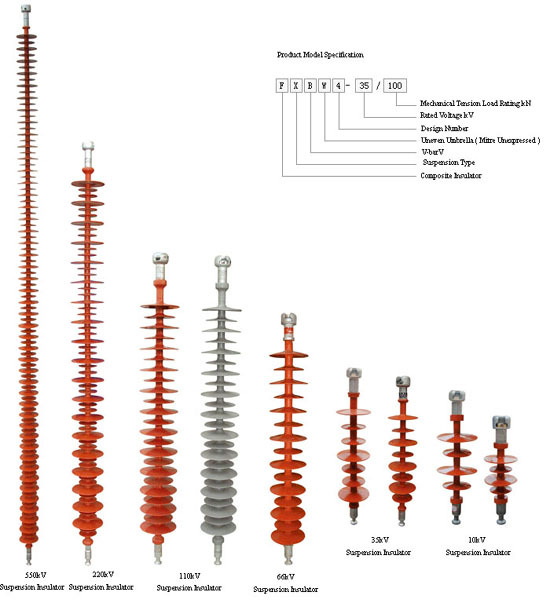 15kv, 25kv, 35kv ANSI deadend insulator, 66KV, 110KV, 220KV, 400KV,500KV polymer suspension insulator and etc is normally used. The type code is normally FXBW Type.